ABBYY FlexiCapture for Mailrooms is the solution for mailroom automation needs of customer oriented businesses. The solution helps to manage the information logistics in an organisation and delivers the right information to the right person at the right time. FlexiCapture for Mailrooms is based on ABBYY's Enterprise Capture platform and delivers advanced classification from paper, fax and e-mail. Utilising the highly competitive technology for document classification and data extraction the solution delivers all essential functionality for establishing a fast, cost-effective and transparent mailroom automation. 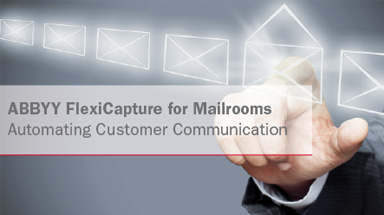 ABBYY FlexiCapture for Mailrooms easily handles multi-channel input and, once integrated into a customer’s processes and systems, will help to maximise business efficiency, improve customer responsiveness and speed up decision making cycles. Fast and accurate classification of all incoming documents and e-mails. Processing of customer communication from any input channel - paper, e-mail or fax. Leveraging from the award-winning FlexiCapture platform to capture data from any document. Capture content from document images and photos, and integrate mobile devices like tablets and smartphones into organization's business processes.